The Menomonee Valley is the Wisconsin's largest tourist destination with more than 10 million visitors per year. Whether you're a local or just visiting, you're sure to find plenty to see, do, and experience down in the Valley! 4 Seasons Skate Park is Wisconsin’s largest indoor skateboard facility offering skateboarding, BMX biking, in-line skating, and scootering. The park offers different areas for all ability levels, so beginners and professionals alike will enjoy the courses. 4 Seasons Skate Park provides participants with the most progressive ramp designs, serves as positive role models, and encourages local youth to practice their sport, grow as individuals, and connect with the community. History roars to life at the Harley-Davidson Museum.® It’s the best of American design and culture – seasoned with freedom and rebellion, showcased in a landmark building. See why the Museum is one of Milwaukee’s top tourist destinations. Soccer stadium and practice field, lacrosse game and practice field and track & field home competition site. Seasonally, a dome complex is fitted over the middle FieldTurf Revolution 360 field during the winter months for competition and training. One of Wisconsin's favorite experiences - nothing beats the iconic experience of a summer tailgate followed by a Brewers game. Potawatomi Hotel & Casino is the city's home for first-class gaming and entertainment. Try your luck at high-stakes bingo, nearly 100 table games, over 3,000 slot machines, a 20-table poker room, and an off-track betting room. Enjoy plenty of free parking and choose from seven on-site restaurants. The Warehouse is a space dedicated to the exhibition of art. Located in the newly renovated 1635 Building in Milwaukee’s Design District, The Warehouse occupies over 5,000 sq./ft. of the building, with over half of that dedicated to exhibitions. The permanent collection consists of over 3,500 works of Modern and Contemporary art including drawings, paintings, prints, and sculpture. Major themes of the collection include self-portraits, monotypes, and contemporary craft. The space is free and open to the public. With buildings designed by the famous Alexander Eschweiler, the first steel exported from Pennsylvania by Andrew Carnegie and brickwork hand-glazed by Tiffany; the City Lights tour will amaze, educate and delight you. Take your tour experience to the next level: Behind-the-scenes; Highlights; Audio; Steel Toe; Bike, Brats, & Beer; Dream Experiences; and Inside H-D: All Day Experience. It's all here. 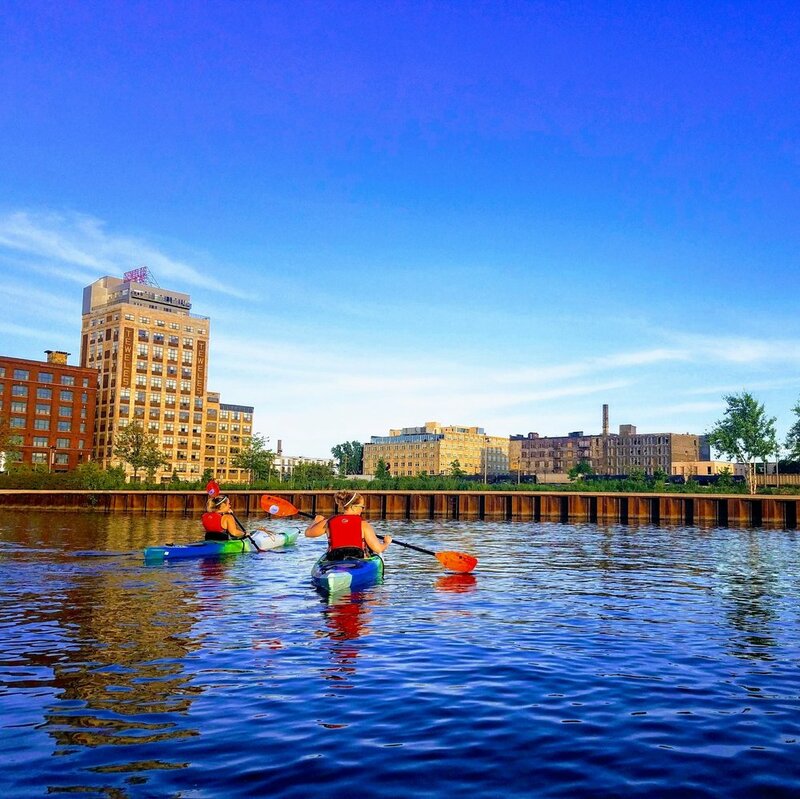 Menomonee Valley Partners & Milwaukee Kayak Company partner each summer to get you on the Menomonee River and its canals while exploring the Valley’s past, vital to Milwaukee's history, and its exciting future. Great for all experience levels! Available tours are listed on our events page or on Milwaukee Kayak Company's events page. Experience the magnificence of Miller Park while enjoying an exclusive tour that includes the dugout, luxury suite level, visiting clubhouse, press box, Bob Uecker's broadcast booth and other behind-the-scenes attractions! The Materials Recovery Facility (or MRF) is where all of our recyclables are sorted and baled for shipment to other facilities that use them to create new products. The City of Milwaukee works with Keep Greater Milwaukee Beautiful to offer a variety of tour and program options. Third Space believes beer is for sharing–with friends and the community. That’s why they created a place for everyone to experience Third Space Brewing. Get behind the scenes and see where the magic happens. Public tours available on most Saturdays at 1:00 and 3:00. $10 tour ticket includes a Third Space pint glass and 2 Third Space beers. Sign up at the bar beginning at noon. Brewery tours are limited to 25 people.